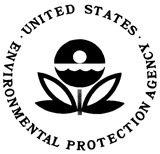 The United States Environmental Protection Agency (EPA) routinely measures soil contamination at various industrial facilities throughout the country. The property owners are then fined an amount based on the total volume of pollutants which have been released into the ground. The pollution is measured by drilling soil cores (straight down) throughout the facility. However, due to various issues including positions of machinery and buildings, the samples can not be taken in a precise grid form. They are instead taken haphazardly throughout the facility. Because of the lack of gridded data, to determine pollutant volume, the data must be interpolated/extrapolated on to a grid. To assess how different interpolation techniques fair, we can plot out our interpolated grid in 3D, and visually assess the fitness of different interpolations for solving this problem. In the following images, the scale shown below will be used. Nearest Neighbor interpolation provides a reasonable result, but it sure looks "blocky", and it is non-differentiable. Because of it's lack of differentiability (lack of smoothness) it can easily be criticized as a non-realistic view of the pollution data. 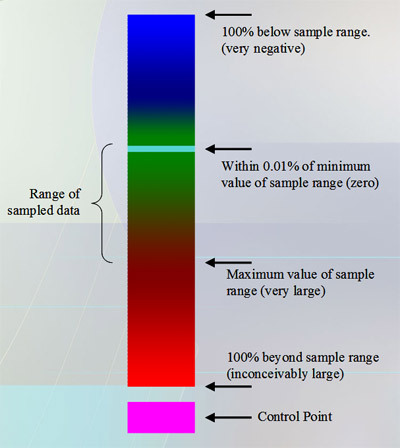 Shepard's method improves on Nearest Neighbor interpolation, however it shows that there are trace amounts of pollution beyond the points at which pollution ceased to be measured (light green). This is a very arguable result, and the EPA would have a tough time billing the company based on an interpolation such as this. Multiquadric interpolation does fairly well near the surface where the data points are plentiful, but as you can see, the interpolation is non-bounded, and yields results indicating that there is a huge reserve of NEGATIVE pollution deep in the ground!!! Yikes! This one's out of the running. Volume Spline interpolation provides the most interesting results of all the tested interpolation methods. While the algorithm shows reasonable results near the surface where there are many sampled points, it doesn't take much before it starts returning erroneous results. Some strange results include: NEGATIVE pollution at the front part of our grid, and at the surface near two pollution spots, and a HUGE RESERVE of pollution deep in the ground. This method obviously fails. Microsphere Projection seems to provide the best solution for this particular problem. It is bounded by the minimum and maximum of the data, so we are guaranteed to never see negative interpolated pollution values or values that are extreme. It is also differentiable, so we are presented with a far 'smoother' interpretation of the pollution diffusion.